WOW! First off we would like to thank EVERYONE who came out to Surf & Adventure Co. on Friday, Feb. 15 for the Wahine Surf Club Logo Contest Finals Party! 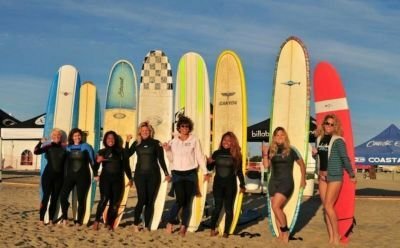 It was so awesome to see the local surfing/SUP community come together for what turned out to be a huge night for the Wahine Surf Club. When we started the club last year, it was our goal to provide our local community with an awesome resource of surfing/SUP/waterman sports information, events, meet-ups, etc. As our Facebook group continued growing, it was clear that we had something very real brewing! So to start of 2013, we decided to bring the club together even stronger by establishing a mission statement, vision statement and this blog. It was also clear that we needed a logo to represent the Wahine Surf Club moving forward. We teamed up with our friends at S&A and decided to launch the Wahine Surf Club Logo Contest, and we were blown away with the amount of submissions we received and the crowd that came out to the finals party! It was incredible to see the amount of effort and creativity that went into the 83 designs that were submitted! After considering several factors, we carefully selected the top 10 designs and the winning design, which was drafted by Candace Burns of Virginia Beach! Candace is a student at James Madison University and a Kellam High School graduate. She said she almost wasn’t able to enter the contest due to difficulties reserving her spot at JMU’s design lab. We are so glad that she did! Her clean, classic design gives us an iconic logo as we continue to grow! In winning the logo contest, Candace also took home a custom resin-tinted Clark Shapes 9’0 noserider, a Contour ROAM camera kit and a $100 gift certificate to Surf & Adventure Co. Awesome! The night was a blast with a catered dinner by Boardwok and door prizes galore — all the while all 83 logo submissions played on monitors throughout the shop. Big thanks to the other nine finalists — Valerie Spivey, Diana Bayless, Shawna Bird Holland, Jasi Nortiz, Gil Carolino, Tom Lipe, Bob Langston, Camie Romano and Jon Bush — and everyone who submitted a design! Check out the videos below for slideshows of all 83 submissions and the Top 10/winning logo!